I am walking in the cold rain. My hands are in my pockets and I am looking at the ground. Suddenly, I feel that someone is watching me. 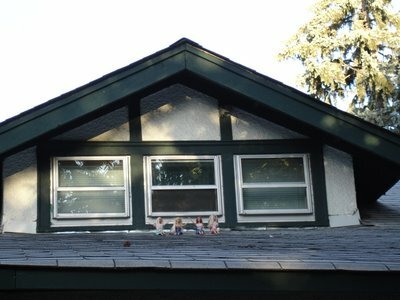 I turn and look up to see four Barbies sitting on a roof top. Their vibrant halter tops and short shorts stand out against the pale gray shingles. They are all smiling and each one has a hand raised above her head, waving to me. They are having a grand old time and the rain doesn't bother them a bit. They still had perfect hair even in the rain, didn't they?